Published By – Dickiebird Music & Publishing Co. Published By – Hendon Music Inc. Published By – Stage Three Music Ltd.
2006 remaster with a bonus disc, housed in a 'Deluxe Edition' transparent digibook sleeve. Track 3-1: Recorded 3rd december 1989 for BBC Radio's John Peel show. This compilation ℗ 2006 Universal/Island Records Ltd.
© 2006 Universal/Island Records Ltd., A Universal Music Company. 3-7: Spanish Castles In Space: Castles In Goa Mix By Youth. Although the outer sleeve says otherwise, it's actually the Extended Youth Mix. 1-1: Published by Orb Music/Big Life Music Ltd./E.G. Music Ltd./BMG Music Publishing Ltd. Recorded at Do Not Erase, London. Programmed at The Coach House, London 24,000 ft & rising. 1-2: Published by Orb Music/Big Life Music Ltd./Copyright Control. Recorded at Do Not Erase, London. Respects to Jasper. 1-3: Published by Orb Music/Big Life Music Ltd./EMI Virgin Music Ltd./Copyright Control. Recorded at Marcus Studios, London. 1-4: Published by Orb Music/Big Life Music Ltd./EMI Virgin Music Ltd./Copyright Control. Recorded at Marcus Studios, London. Programmed 25 miles above the earth. 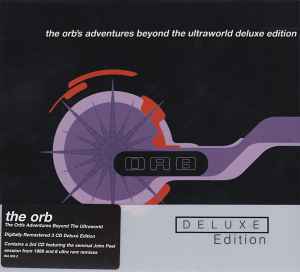 1-5: Published by Orb Music/Big Life Music Ltd./Warner Chapell Muisc Ltd. Recorded at Berwick Street Studios, London. Programmed in Barcelona, Spain. 2-1: Published by Orb Music/Big Life Music Ltd./Copryight Control. Recorded at Berwick Street Studios, London. Programmed in Soho, London. 2-2: Published by Orb Music/Copyight Control/Buddah's Belly Music/Big Life Music Ltd. Recorded at Berwick Street Studios, London. Programmed in Soho, London. 2-3: Published by Orb Music/Big Life Music Ltd./Edition Bingen(GEMA). Recorded at Berwick Street Studios, London. Programmed in Lab Studio, Berlin. 2-4: Published by Orb Music/Big Life Music Ltd./Copyright Control. Recorded at Berwick Street Studios, London. Programmed in Brixton, Southside. 2-5: Published by Orb Music/Big Life Music Ltd./E.G. Music Ltd./Unforgettable Songs Ltd./Perfect Songs Ltd./BMG Music Publishing Ltd. Remixed in outer space. Recorded live at Trancentral, London. Programmed in inner space. 3-1: Published by Chrysalic Music Ltd/ BMG Music Publishin Ltd./Dickiebird Music & Publishing Co./EG Music Publishers Ltd./Perfect Songs Ltd./unforgettable Songs Ltd. Released by arrangement with BBC Music. © 1991 BBC Music Enterprises Ltd.
3-2: Published by Chrysalis Music Ltd. Remix & additional production for Boys Own Productions. 3-3: Published by Chrysalis Music Ltd./BMG Music Publishing Ltd./EG Music Ltd./Famous Music Corporation/Hendon Music Inc.
3-4: Published by Chrysalis Music Ltd./Stage Three Music Ltd.
3-6: Published by Chrysalis Music Ltd./BMG Music Publishing Ltd./Dickiebird Music & Publishing Co./EG Music Publishers Ltd./Perfect Songs Ltd./Unforgettable Songs Ltd.
3-7: Published by Chrysalis Music Ltd./Warner Chappell Music Ltd.
A rarity in the vast cesspit of modern remasters, this is a great improvement in sound over the original. Clarity, detail, balance and decent bass final appear for this stunning album. Hooray!